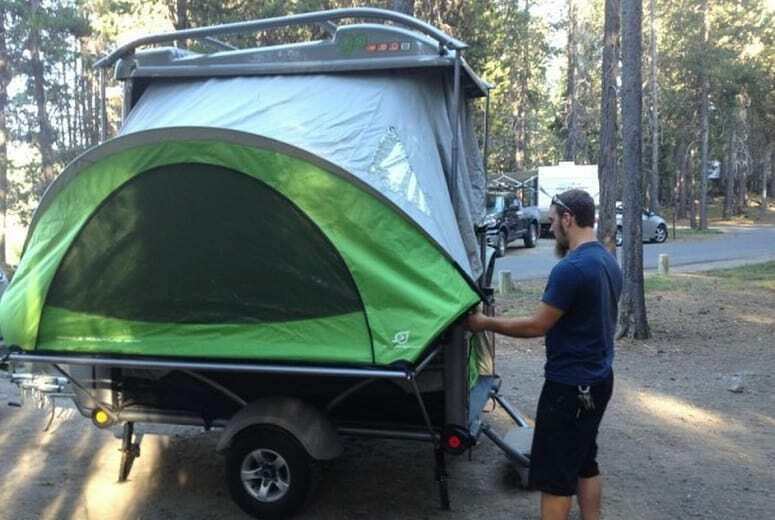 If you are reading this, you are probably already considering buying a pop-up tent trailer. Whether or not this is your first RV, you should know all the facts before deciding or making a purchase. An informed buyer is a happy one. You want to know exactly what you’re getting into before taking the plunge. What will maintenance be like? How does it feel to sleep in it? These questions and many more will be answered in this review. Then you can decide if pop-up tent trailer ownership is the right choice for you. There are many factors that influence an RV’s price. The type, condition, size, and extra features are just a few. Trailers are almost always going to be less expensive than motor homes. Pop-up tent trailers are the most basic type of trailers, meaning they tend to be cheaper. A standard pop-up tent trailer (new) can cost you from 4,000 to 13,000 dollars. Compare that to a new travel trailer, where prices begin at 8,000 dollars. Motor homes can be worth over 100,000 dollars for advanced models. You can also find higher end models, although of course the price increases along with the extras. 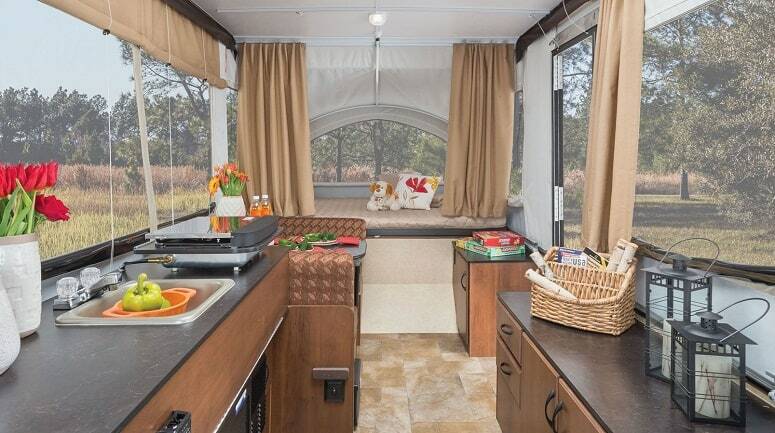 These types of pop-up camper come with non-standard features, for example: front deck storage, or luxurious extras, such as heated mattresses. Used campers can also vary significantly in price. If your ideal pop-up tent trailer is out of your budget, you might be able to find it for less secondhand. There are a few reasons you may be thinking of buying a used model. If your ideal pop-up tent trailer is out of your budget range, you might be able to find it cheaper secondhand. You may also be averse to shelling out full price for a brand new camper. These reasons are valid, but you should also know what you are getting into. Conditions can vary dramatically. Even if you save money in the purchase price, you can spend double that on repairs. It is important to identify if needed repairs are minor or major. With second hand RVs in general, you need to perform a thorough inspection prior to purchase. If you are looking to save money, avoid purchasing a pop-up tent trailer with water damage. This includes soft, rotting floors, ripped up canvas, or a leaky roof. Replacing broken lift systems or frames is not cheap. Set up and pack away the pop-up tent trailer yourself, to check for issues. Take the trailer for a tow to identify possible problems with the axle alignment. Ask the seller about the age and condition of the tires and brakes. You should test every single aspect of a secondhand pop-up trailer before buying it. This includes running the water inside and trying out the electrics. You don’t want any nasty surprises once the sale is final. 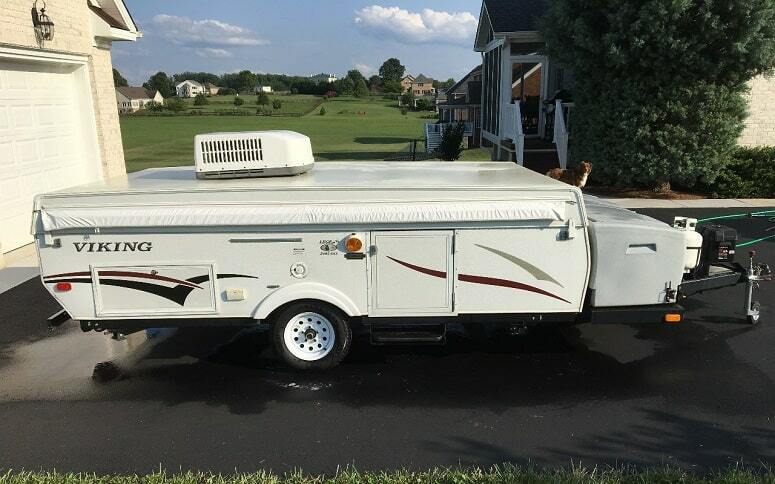 Buying the trailer itself is only the beginning. Due to the compact nature of these trailers, there are items you will likely have to buy to save space. If you’re a former RV owner, you may already have some (if not all) of these things. 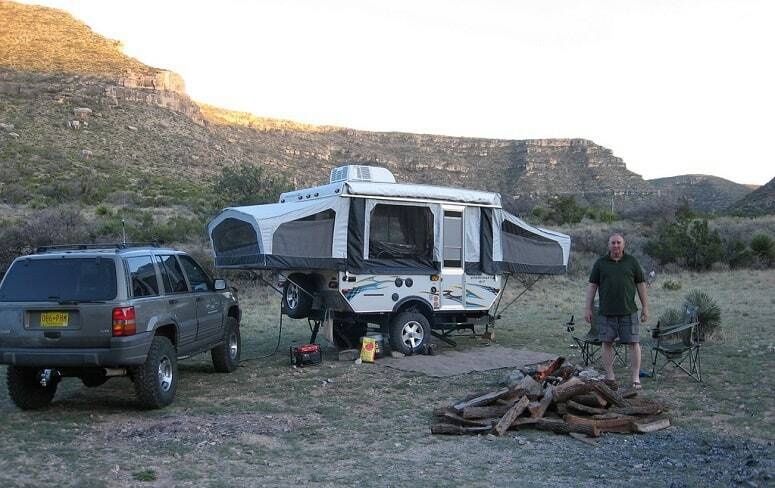 If the pop-up tent trailer is your very first RV, you will need to start from scratch. Appliances, trash cans, toiletries—think small. Get a miniature BBQ unit for your pop-up tent trailer rather than a full size one. Tea-lovers can choose a collapsible tea kettle to fold away after use. A mini coffee maker works just as well as a big one. Collapsible trash cans won’t take up space and can be used in or outside of your trailer. Pop-up tent trailers can include built-in storage areas, but they tend to have limited capacity. There are creative strategies you can use to maximize the space available. A few investments early on can allow you to bring more than you expected on your trips. Buy a towel rack to stick to the back of cabinets, to hold pot and pan lids. Alternatively, install basic wooden shelving for this purpose as in the photo. Get a hanging caddy to keep personal belongings by your bed. Vacuum seal bags are ideal for transporting bulky items, like sleeping bags and pillows. Pop-up tent trailers are light and compact. Naturally, this means they have thinner walls than a motorhome or travel trailer. This is the case with both hard-walled and soft-walled models. Think carefully about climate control before you choose a pop-up tent trailer. 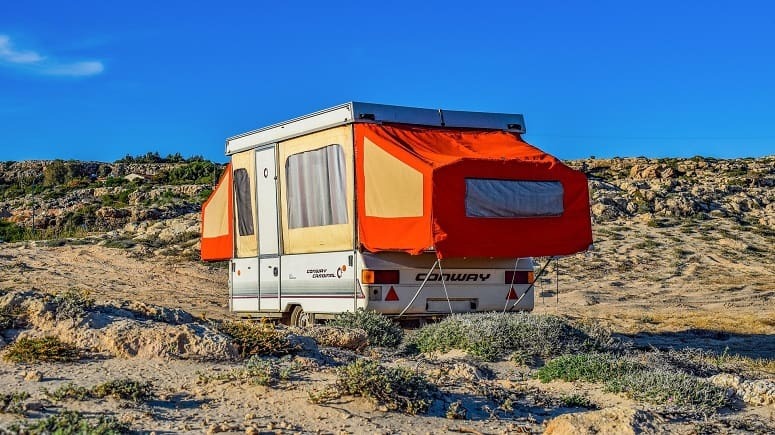 Not all campers contain air conditioning units, heaters, or furnaces. If you are unwilling or unable to buy a pop-up tent trailer with these features, be prepared. Both high and low temperatures can hit your pop-up tent trailer hard. Thin walls mean less insulation against extreme cold and heat. There are special Arctic packages engineered for extreme cold. You don’t want to end up baking (or freezing) in your camper. Heavy duty fans can help you beat the summer heat, if you don’t have an AC unit. A heated blanket can be an excellent way to keep you toasty in chilly weather, especially at night. The thin walls of most pop-up tent trailers will not insulate against outside noises. You might feel like loud neighbors at a camp site are living inside your trailer with you. If you head way out into the wilderness, you can avoid this issue. Still, there are some sounds that are inescapable—like your generator. You can select generators that are built to be quiet, but noise-sensitive individuals might still be bothered. If the thought of hearing the constant hum of a generator irritates you, perhaps reconsider a pop-up tent trailer. Popup tent trailers allow you to get the full camping experience, also known as boondocking. Motor homes or larger trailers can isolate you from the outdoors. These trailers, on the other hand, are just a few steps up from a tent. Solo pop-up tent trailers are basically tents on wheels! Your pop-up tent trailer offers as much (or as little) protection from the elements as you choose. You can unzip the pop-up tent to enjoy the fresh air and sleep under the stars. There are very few restrictions when selecting a camping location with your trailer. You can find pop-up tent trailers that are capable of going off-road. So long as your vehicle can travel through the wilderness, these types of trailers can too. 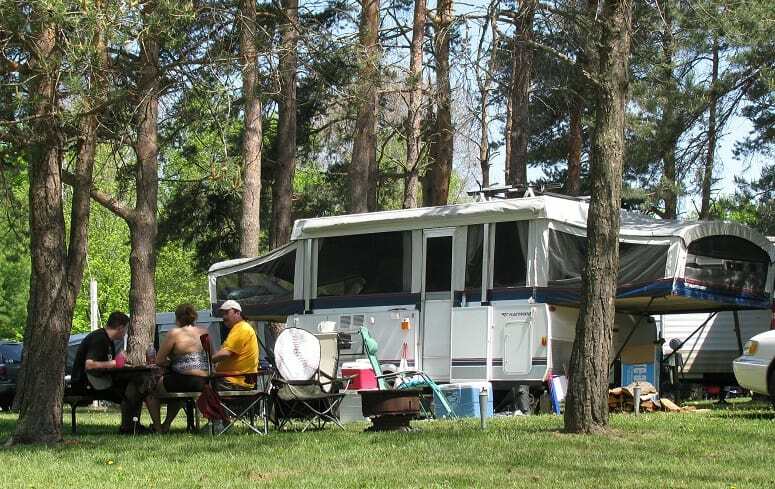 Campsites as well as national parks can have size restrictions for RVs. Pop-up tent trailers generally fall well under the maximum allowed length. Like all trailers, pop-up tent trailers offer freedom for active travelers. If you are eager to visit tourist attractions or scope local activities, you can. Leave your trailer at a safe campsite and take your car or truck out for a spin. Hassle-free parking and adventure! Pop-up tent trailers can be just as suitable for families as they are for solo travelers. It all depends on the size of the model you buy. Some have room to sleep up to eight people when they are set up. This doesn’t mean that privacy and space are guaranteed. In fact, privacy is a rare commodity in most pop-ups. You will have to be prepared for staying in close contact with your traveling companions. You will be sleeping, eating, and living in a small space. Unlike separate tents, everyone will share the same environment. You might feel comfortable in a pop-up tent trailer for a few hours, but what about a few days? It’s important to fully understand this aspect of pop-up tent trailers before buying one. Your spouse, family, or whoever you are traveling with, also have to be prepared. Bathrooms on pop up tent trailers can range from nonexistent to shower-inclusive. 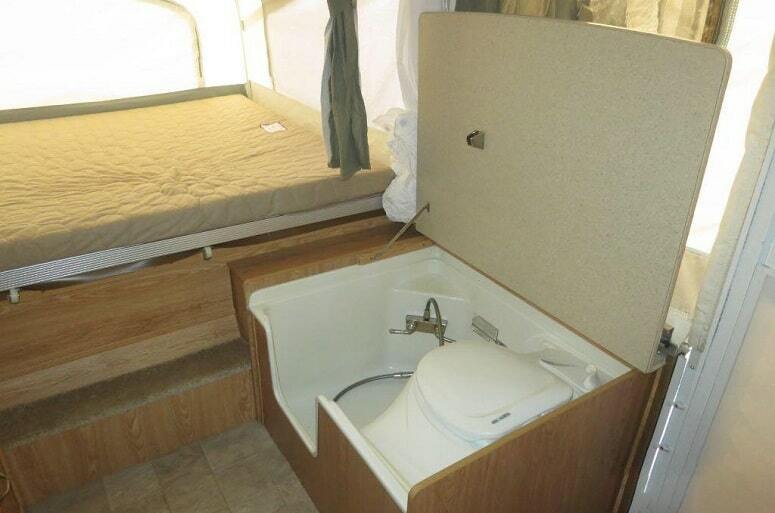 But even the most advanced bathroom in a pop-up tent trailer cannot compare to a motorhome. If your desired model does not have a bathroom, you have several options. You can purchase a porta-potty for trips into the wilderness. Alternatively, you can take your pop-up trailer to camp sites that have restroom facilities for everyone. Or, you can dig your own latrines at your campsite (if allowed). A multi-purpose privacy tent can make long camping trips easier. You can put porta-potties in them or use them as showers or changing areas. If none of these choices sound appealing to you, consider a pop-up tent trailer with a bathroom. Models that include bathrooms are usually larger in size and, of course, more expensive. If you have never owned an RV before, it can be somewhat daunting to use one for the first time. The good news about pop-up tent trailers is that they are beginner-friendly. Very few people are comfortable driving or towing large RVs right away. Motorhomes, in particular, require a period of adaptation, due to their size. Some types of RV even require that you get a special license. Pop-up tent trailers can be towed by most vehicles. They are light and compact, which makes the adjustment process easier than for a larger trailer. Know your vehicle’s maximum tow weight. Some models of pop-up tent trailers may be too heavy for your car. You will have to practice handling your pop-up tent trailer beforehand. Even if you’re familiar with towing, you need to get used to how your specific trailer handles. Parking, reversing, and braking are different when you are towing a trailer. The same goes for making turns, accelerating, and driving in bad weather. When towing a trailer of any type, develop the habit of checking your hitch. Examine it before you leave, at rest stops, and when you reach your final destination. Pop up camper trailers also make for stress-free route planning. One major downside of traveling with a big RV is finding friendly routes. Bridges that have weight restrictions, and overpasses with height restrictions, can cause long detours. Pop-up tent trailers do not usually exceed such limits. The complications of storing an RV can intimidate prospective owners. Your vehicle has to be kept somewhere appropriate when it is not in use. Pop-up tent trailers are among the most convenient RVs to store. When folded, most models take up little space. If you clear out your garage, your pop-up might fit inside. If not, it can be left covered in your driveway or yard. For those of you who live in apartments, you may have to find a storage facility. You are still likely to pay less since your pop-up tent trailer will not require a big unit. If possible, try to keep your investment indoors when not in use. Even when covered, pop-up tent trailers can sustain damage from harsh weather conditions. Taking the time to prep your trailer for storage is a necessity. Pop-up tent trailers may be simple, but they are not self-maintaining! You will have to clean it thoroughly and ensure it is protected against pests. Mice can be destructive to pop-up tent trailers, chewing through canvas. Ensure that holes are patched up or caulked prior to storage. Get your trailer as empty as possible before you store it. Take out valuables, cloth items, and all food and drink. Make sure it is not wet before you put it away. Leaving a pop-up tent trailer folded up wet will cause irreparable water damage. Pop-up tent trailer maintenance involves more than you might expect. Neglecting to care for your trailer correctly can shorten its lifespan. It can also be dangerous for you to allow it to fall into disrepair. Pop-up trailer tents should never be stored wet. This encourages mildew and mold to thrive, which can be dangerous to breathe. It also weakens the canvas significantly. The next time you use it, you may find the fabric rips before your very eyes as you’re opening up. Not a pretty sight, especially after a long journey to the camp ground with grizzly kids in tow. Can you tell I’m writing this from experience? Cleaning the pop-up tent fabric is important too, again to discourage mildew and mold from starting or spreading. Inspect your tent fabric for any holes or tears. It is best to sew or patch up damaged fabric as soon as you notice it. A little rip can turn into a big problem if left unattended (see my comment above). Always check your trailer tires for signs of wear and tear. Tires that look flat, lumpy, or thin should be replaced. On average, trailer tires last for five years. Pop-up trailer tents have a lot of separate parts. It is important to keep all these parts lubricated and functional. If a part breaks, it can compromise the whole system. If anything is unfolding stiffly or seems broken, investigate the issue. The portability of pop-up tent trailers comes at a cost: the setup. Unless you have a basic solo pop-up trailer tent, this can take time. Packing it all up again at the end of your trip takes just as much time, if not more. All of this involves physical effort. Many pop-up tent trailers have hand-crank systems. Support poles for the tents have to be put into place. The interior as well as exterior has to be fully unfolded. This work will need to be done, even when the weather isn’t cooperating. Whether it’s hot, raining, or cold you will still have to set up your home from home. Don’t forget necessary maintenance! The canvas of your pop-up tent trailer will have to be dry before you fold the whole thing up. Or re-opened to dry when you arrive home. Your utilities are DIY with these trailers. The generator has to be safely hooked up. If your trailer doesn’t have a bathroom, the facilities (e.g. privacy tent, RV toilet and porta potty) must be readied. If all of this sounds overwhelming, reconsider a pop-up tent trailer. If you have physical limitations and plan to travel solo, or as a single adult with young kids, this type of trailer might not be for you. Before you choose a pop-up tent trailer, know what you want. There are questions you need to answer before making the final purchase. If you want to play it safe, buy a pop-up tent trailer new. You don’t have to worry about unexpected problems cropping up after purchase, as most come with a warranty. You can invest in an extended warranty with the manufacturer in case of future problems. If you feel confident in screening secondhand pop-up tent trailers, go ahead. If you find a bargain, and are willing to shoulder the cost of repairs, secondhand shouldn’t be a problem. Do you plan to go boondocking or prefer to stay at campsites with resources? Check that the trailers you’re considering are compatible with your plans. An off-road pop-up tent trailer is ideal for heading out into the wilderness. If camping rough isn’t your thing, you don’t have to compromise too much on comfort. If you are a sports enthusiast, select a pop-up tent trailer that suits you. For example, one that is capable of carrying canoes, kayaks, or other equipment. Be honest with yourself about what you need. Remember that pop up tent trailers come in a range of shapes, sizes, and forms. Amenities can be basic or advanced. If a smaller model is too cramped for you, look at the next size up. If the thought of living without a bathroom is unbearable, don’t check trailers without them. The last step you might want to think about taking before you buy a pop-up trailer tent, is renting one. Extensive research, no matter how helpful, can’t compare to the real thing. You can check out RV rental websites and choose your desired trailer model. Just like with purchasing, pop-up tent trailers are less expensive to lease than motor homes or bigger trailers. Renting will give you a good idea if a pop-up tent trailer is right for you and your needs. It will also give you the opportunity to get used to towing before you buy one of your own. Treat the rental as if it is your own while you have it—you can even practice cleaning the exterior! You can experiment by renting different sizes and types of pop-up tent trailer (e.g. hard walled or soft walled). I hope that we helped you feel closer to deciding if a pop-up tent trailer is right for you. Choosing to buy an RV of any kind is a serious decision. Pop-up tent trailers have plenty of benefits, but this doesn’t mean they are for everyone. You need to be aware of the negatives as well as the positives before you pay up. Did this article help you? If you have used a pop-up tent trailer, is there anything else you think potential owners should know? Share your tips and stories about your experiences in the comments. If you find these suggestions useful, share the article!